Rushing headlong into a significant moment without proper preparation usually means you are going to miss the point! I can’t tell you how many times I’ve looked back on a significant moment in my own life and said “Boy if I knew then what I know now!” Yep, hindsight’s 20/20. On this Holy Thursday we will hear the Twelve Gospels. We will light candles and we will hear the whole story of the Lord’s Passion and His life-giving death. We will have the benefit of hindsight of this whole moment in the saving Life of our Lord Jesus. But His disciples weren’t so fortunate, and they needed significant preparation to face what was ahead of them. And the Lord obliges, as He always does. But His method of preparation may seem a little strange to us. He washes the feet of His disciples. When it was evening, he sat at table with the twelve disciples; Jesus, knowing that the Father had given all things into his hands, and that he had come from God and was going to God, rose from supper, laid aside his garments, and girded himself with a towel. Then he poured water into a basin, and began to wash the disciples’ feet, and to wipe them with the towel with which he was girded. He came to Simon Peter; and Peter said to him, “Lord, do you wash my feet?” Jesus answered him, “What I am doing you do not know now, but afterward you will understand.” Peter said to him, “You shall never wash my feet.” Jesus answered him, “If I do not wash you, you have no part in me.” Simon Peter said to him, “Lord, not my feet only but also my hands and my head!” Jesus said to him, “He who has bathed does not need to wash, except for his feet, but he is clean all over; and you are clean, but not every one of you.” For he knew who was to betray him; that was why he said, “You are not all clean.” When he had washed their feet, and taken his garments, and resumed his place, he said to them, “Do you know what I have done to you? You call me Teacher and Lord; and you are right, for so I am. If I then, your Lord and Teacher, have washed your feet, you also ought to wash one another’s feet. For I have given you an example, that you also should do as I have done to you. Truly, truly, I say to you, a servant is not greater than his master; nor is he who is sent greater than he who sent him. If you know these things, blessed are you if you do them. The roads of the Lord’s day were dusty and usually just dirt. Only the most important roads or the main roads were stone. That meant that most people had dirty feet most of the time as they traveled. In fact, it was mere courtesy to offer guests a place to wash their feet when they visited your home for an event. Usually the lowest slave was tasked with assisting guests to wash their feet. It was a sign that this slave or servant was at the bottom of the pecking order of servants! 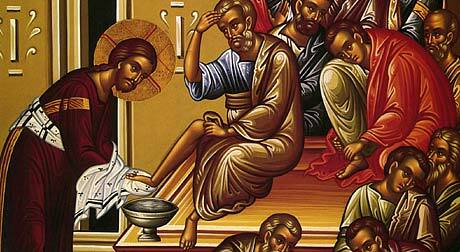 But here, the Lord Himself disrobes, wraps a towel around Himself and gets the basin to wash the feet of His disciples! Of course dear Peter, impetuous as always, protests and hears amazing words: “If I do not wash you, you have no part in me.” Peter’s tune quickly changes to “then don’t just wash my feet! Wash my hands and my head too!” Don’t you just love Peter? As we contemplate this scene of humility and love from Christ, we hear life-giving instruction from Him to us all. This object lesson is meant to show that if the Incarnate God Himself stoops to clean the feet of His disciples, we must forever banish the notion that leadership means anything other than service. The Lord ups the ante of the moment by promising that if we truly know the truth of this then we are blessed if we follow through and practice this kind of servant leadership. Today, as we step that much closer to the bright darkness of Holy Friday, as we listen to the 12 Gospels and light the candles one by one, allowing that “light” to enlighten our hearts, let’s embrace the hard work of learning the humility of service to one another and see in our humility our unity with Jesus Christ. All the preparation is here for us to enter into Pascha well and ready. All we need is in the prayers, the acts, the liturgies of our most life-giving faith. All we have to do is have the courage to be humble; to have the strength to appear weak; to be Orthodox on Purpose.